The Air Force of the western region has issued a statement saying it has carried out airstrikes on the gatherings of Khalifa Haftar’s forces in the camp of Mizda in southern Gharyan city and on the positions of Haftar’s forces in Sooq Al-Khamis area. 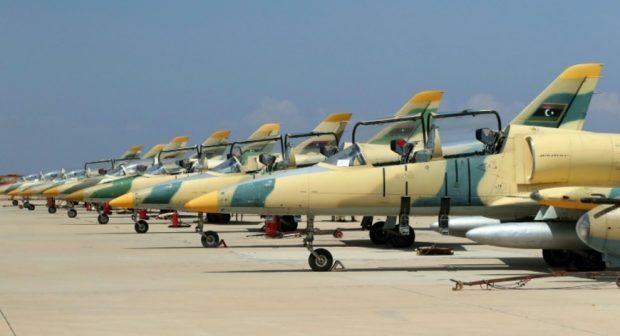 The Air Force, which is the under the command of the Presidential Council in Tripoli, said its fighter jets are carrying out reconnaissance flights over the tension areas and would be targeting any attacking forces from eastern Libya led by Haftar. In the meantime, the commander of the general security apparatus in Tripoli, Emad Al-Tarabelsi, told reporters on Saturday that after clashing with Haftar’s forces in Al-Aziziya, they had withdrawn towards Gharyan.